This entry was posted in News and tagged news on October 23, 2014 by Meredith. HK Helpers Campaign volunteers Meredith McBride & Vivian Yan spoke to some of the city’s domestic worker community about the Umbrella Movement occupation protests. 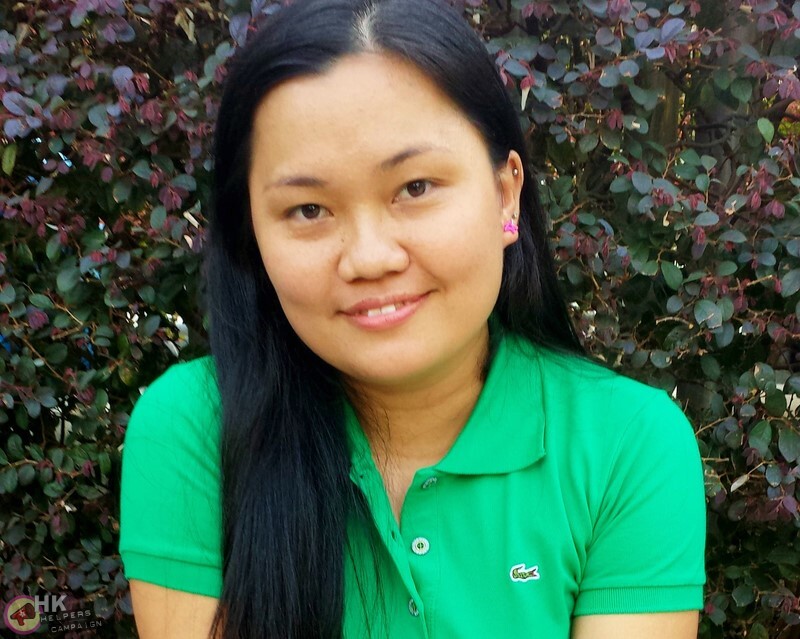 Catherine, from the Philippines, has been living in Hong Kong for 3 years. This entry was posted in News and tagged news on October 10, 2014 by Meredith. Former civil servant Au Wai-chun has been granted an eighteen month probation after being found guilty of causing actual bodily harm to Raksona Begum, who was working in her home in Tseung Kwan O in September of last year. Begum was hospitalised for five days after receiving first and second degree burns from a boiling cup of water Au poured on her chest. Au received a six month jail sentence, which was overturned after she explained to the judge that she had ‘lost her temper’. Au received support from her current domestic worker from the Philippines, who allegedly wrote to the court to ask for leniency. 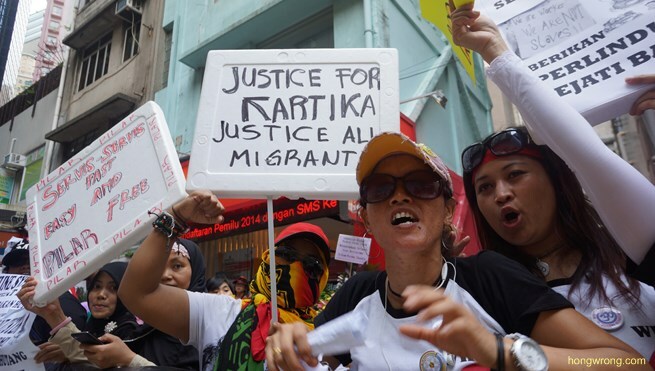 After the verdict, domestic worker advocates expressed their concern that a woman found guilty of assaulting a migrant domestic worker in her home would be permitted to hire another. This entry was posted in News and tagged news on October 9, 2014 by Meredith. On September 31st, Hong Kong’s Labour Department announced that the minimum allowable wage for domestic workers will increase by HK$100 per month. The figure is a 2.5% increase on their previous monthly salary of $4010. The increase will only apply to new contracts signed after October 1st of this year. Domestic workers with existing contracts and those who signed contracts in the days before the announcement will have to wait until their current contract expires before obtaining the wage increase. Domestic workers who do not get food from their employers will also receive an additional $44 per month for food allowance. The announcement was met with little joy however, as Hong Kong inflation has increased by 3.6% over the past year according to the Census and Statistics Department. The result is that domestic workers are actually earning less than they did a year ago. This entry was posted in News and tagged news on September 18, 2014 by Tom Grundy. A son of a Filipino domestic worker, who was born-and-raised in Hong Kong, has lost his fight for permanent residency. Five judges at the Court of Final Appeal agreed unanimously that Joseph James Gutierrez, 17, does not qualify for permanent residency under Article 24 of the Basic Law. His mother, Josephine Gutierrez, has worked in Hong Kong as a helper since 1991. Joseph had been present in the city for more than 7 years, with only short gaps as he visited the Philippines. The judges said that he did not meet the criteria for being “ordinarily” resident. This entry was posted in Blog and tagged blog on September 15, 2014 by Tom Grundy. 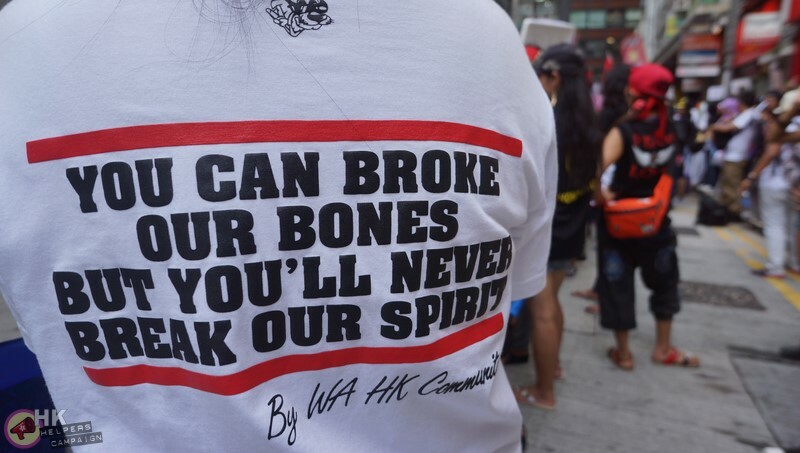 HK Helpers Campaign is a successful and much-needed platform fighting for the rights of domestic workers in Hong Kong. To continue our work, our multimedia advocacy and legal project needs more hands on deck. Over the past nine months, our campaign has worked with dozens of journalists and media outlets to raise awareness of the challenges domestic workers face. Professional photographers and videographers have linked with us to help shape the debate and shine a more positive light on the local helper community. Our campaign has been featured on CNN and in the Wall Street Journal, Quartz, the Guardian, the South China Morning Post and others. Our website is a respected hub for breaking news, research and events information whilst our legal team is assembling cases to challenge the law. We are now hosting support information for the community in six different languages. This summer, we were officially registered as a society and began work on our Chinese website launch. This entry was posted in News and tagged news on September 9, 2014 by Tom Grundy. The couple who tortured Indonesian helper Kartika Puspitasari have had their appeal rejected by a judge who called their behaviour “inhuman“. Tai Chi-wai and Catherine Au Yuk-shan were convicted of eight counts of assault last year. They received jail sentences of three years and three months, and five years and six months, respectively. During the trial, the court heard how the couple beat Kartika with hot irons, a paper cutter, a shoe, a hanger and bicycle chains. Mr Justice Wally Yeung Chun-kuen, the Court of Appeal’s vice-president, said that the court had a duty to protect foreign worker’s rights. “…they used severe ways to torture another parents’ daughter [Kartika]… Hong Kong is a modern, civilised city and is serious about human rights. We will not tolerate these inhuman acts as the couple did to the victim”, Yeung said. This entry was posted in News and tagged news on September 9, 2014 by Meredith. On September 1 the District Court convicted former civil servant Au Wai-chun of causing actual bodily harm to Begum Raksona, a woman from Bangladesh who did domestic work in her home. The incident occurred in September last year at Au’s home at Bauhinia Garden in Tseung Kwan O. The court heard that a dispute arose when Au became angry that a cup of water given to her by Raksona was not hot enough.